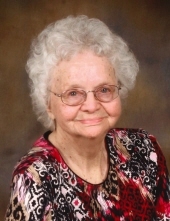 Geneva Frances Weaver Hawkins, 97 of Crab Orchard, Kentucky passed away Sunday morning, February 10, 2019 at the Fort Logan Hospital, Stanford, Kentucky. Geneva was the widow of Delbert A. Hawkins, Sr. who preceded her in death on August 29, 2012. She was born August 13, 1921 in Whitesville, Indiana the daughter of Nathaniel and Lottie Rector Weaver. She was a loving Daughter, Wife, Mother, and Grandmother and lifelong member of Watts Chapel Baptist Church. In addition to her parents and her loving husband, she was preceded in death by 11 brothers and sisters. Funeral Service 1 PM, Friday, February 15, 2019 at Watts Chapel Baptist Church with Bro. Dan Gutenson, Bro. Tony Shelton & Bro. Jeremy Johnson officiating. Burial will follow in the Crab Orchard Cemetery. Visitation will be held on Thursday, Feb. 14, 2019 after 5PM at McKnight Funeral Home and after 11 AM on Friday until 1 PM funeral time at Watts Chapel Baptist Church. Josh & Foster Shelton, Robbie Fletcher, Hunter Killen, Joseph, Jacob & Jeremy Johnson will serve as pallbearers. Memorial Contributions can be made to Gideons International Bible Fund or the American Cancer Society. To send flowers or a remembrance gift to the family of Geneva Weaver Hawkins, please visit our Tribute Store. "Email Address" would like to share the life celebration of Geneva Weaver Hawkins. Click on the "link" to go to share a favorite memory or leave a condolence message for the family.